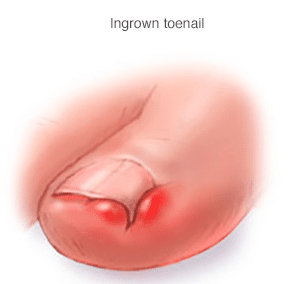 If you’re suffering from an ingrown nail then we don’t need to tell you how painful it can be. Many of you have families or are on your feet all day long so the last thing you need on your plate is debilitating foot pain that makes even walking painful. You have busy lives and you can’t be on the sidelines for very long. While ingrown nails are very common, that doesn’t make having them any less painful. The nail will dig painfully into the soft tissues around your nail grooves. Aside from pain, irritation, redness, odor, and swelling can occur. At Laser Podiatry Associates we will fix your ingrown nail problem right here in our office. Drs. Benjamin and Mullendore have been working on cases like these for over 40 years. We can remove the ingrown portion of the nail or prescribe a topical or oral medication to help treat the infection (if needed). However for more chronic problems, we may have to perform a procedure to permanently treat ingrown nails. If surgery is required we can do it in-house, or, if severe, it can be performed at our sister surgical facility, the Medicare approved Twin Arch Surgical Center. If you want to stop suffering from those pesky ingrown nails then call us at Laser Podiatry Associates today for your consultation with our trained and Board certified staff.